Cutting Unit Coverage Design : A unique moving cutting unit cover incorporates the v guide of the cover belt. This eliminates lump & ball formation, avoids over fermentation and ensures uniform cutting. 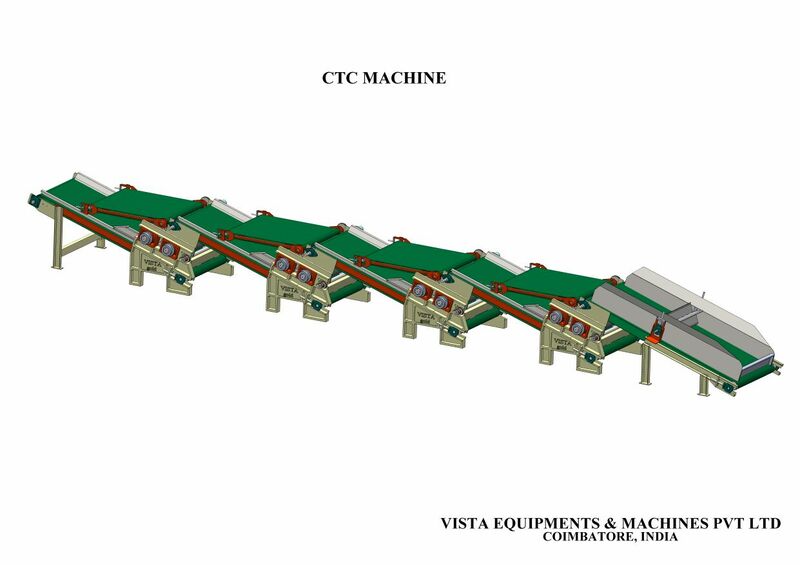 Better, Long Life Conveyor Belts : The VISTA CTC is fitted with special hygienic imported PVC belts which are easy to scrape and clean. Heavy Duty Construction : VISTA CTC is built for extra rigidity & vibration free operation. It’s heavy duty construction guarantees long life and negligible maintenance costs. Superior Gear Box : VISTA CTC comes with a specially designed induction hardened gear with large diameter input/output shafts and heavier bearings. This ensures trouble free operation and also enhances the gear box and adaptor life. Comes with a 5 Year Guarantee! Cooling Arrangement : Cold air introduced from behind the rollers prevents leaf temperature from rising, thereby improving the quality of liquor. Easy & Fast Roller Removal : The VISTA CTC design eliminates top arm removal during roller change. The Unique roller withdrawal mechanism makes removal of rollers convenient and quick. Bearing Sleeves : Hardened and ground bearing sleeves are provided on the mandrel bearing journals to ensure minimum damage to bearings. The sleeves can be easily replaced. Machine Height Reduced : The reduced height provides better access for maintenance and easier roller setting and mesh adjustment.